Why do we think that Tommy Bahama produces the best beach chairs? They have a simple, stylish design, are strong and very easy to carry. 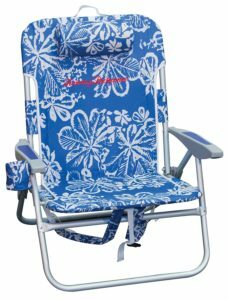 Of course, some are better than others but there is little doubt that Tommy Bahama sets the standard for beach chairs. However, before you continue reading it should also be noted that we did not only review Tommy Bahama chairs but also different brands of chairs on our quest to finding the right beach chair. 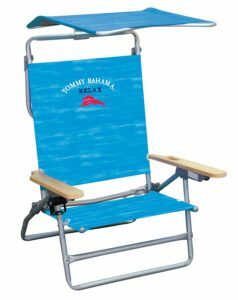 Tommy Bahama produces more than one type of beach chair. You can really find the right chair to suit your needs and budget while still buying one of the best products currently available on the market. Of course, beach chairs are not exclusively for the beach. These versatile chairs can be extra seating when having a garden party. They can even offer a seat at the thanksgiving table as well as if you decide to go camping! 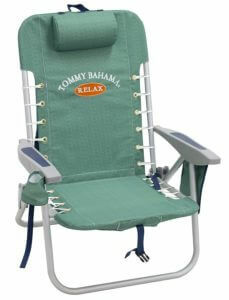 The options really are unlimited which is why it is essential that you choose a well made Tommy Bahama beach chair. Fortunately your decision will be made much easier by this review. We’ll highlight the 8 best Tommy Bahama beach chairs, the PROs and CONs of each one and a brief summary. All you need to do is choose! It should be stated that this pack comes with 2 chairs and a medium tote bag and has the award for best value chairs on this review guide! The chairs are bright with a variety of shades of blue and green and solid plastic arm rests. They weigh just 15 pounds each and measure 27 inches by 25 inches with the seat base being a comfortable 9 inches off the ground. Aluminum frame; rust proof and lightweight. Comfortable with 600 D polyester which can take weights up to 300lb’s. Storage pouch which is insulated; ideal for keeping your drinks cold. Folding towel bar, to keep your towel sand free. Wide seating area to ensure comfort even for larger people. They only offer one seating position; you cannot adjust it. Plastic parts are the most vulnerable although shouldn’t cause an issue. Potential for closing mechanism to cause damage to the chair as it is stiff. As you can see there are very few negative points about these beach chairs. In general they are well built, easy to carry and robust enough to support your everyday activities; including relaxing on the beach! Again you’ll find this is a pack of two chairs and, although these are a little more expensive they are well built. The look fantastic in green and light blue, you might even consider looking at them instead of sitting in them! Adjustable; you can lay flat in these. There are 5 positions in total. Made from aluminum so they won’t rust even in the salt air. Pillow included; which is adjustable. Padded shoulder straps and a convenient carry handle; which is made of rubber. Insulated pouch for storing food and drink. Can handle weights up to 300lbs. Towel bar not particularly useful. As you can see these chairs are excellent. They are easy to carry like a backpack and even allow you to lay flat. There are no real issues as the customer reviews show; with the exception of the odd manufacturing defect which can happen on any product. This is why this is the best of the Tommy Bahama beach chairs and the top chair on this review guide. 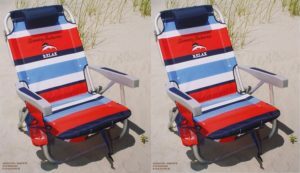 Why buy two beach chairs the same color when you can get this stunning pack with one red and one blue? Not only does this mean you can stake a claim to your preferred color, it can also help you to pick your chair out on the beach! 5 position Recliner – including lay flat option. 600 denier polyester for strength. Carry like a back pack with padded shoulder straps. Tote Bag comes with them. Laying flat on your stomach is not comfortable. Chair can sink into sand making it difficult to get out of! Plastic parts which can break if not looked after. 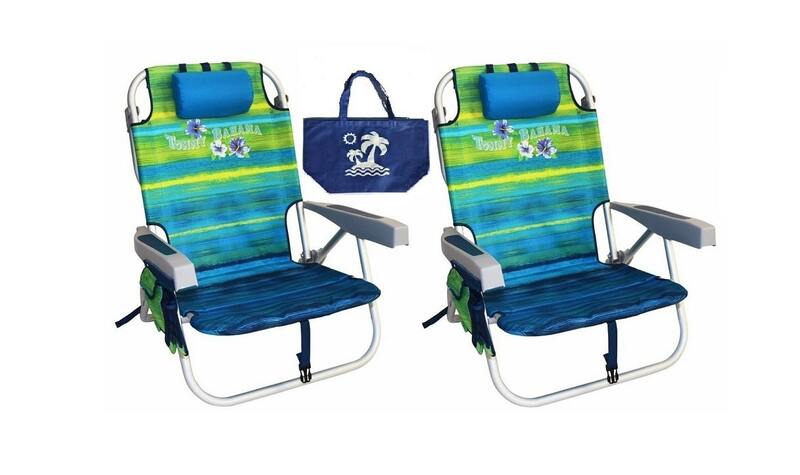 Overall these are one of the most robust and best looking beach chairs sets currently available. They will help to ensure you enjoy your visit to the beach in comfort and sand free! This chair is stylish in a pale green with laces tying it to the frame. It would almost look at home in your office! The chair weighs just 9 pounds which makes it excellent for travelling to and from the beach or even if you decide to go camping or hiking. It measures 28.8 inches by 25 inches although it should be noted that it is only 6 inches from the sand to the seat. The chair weighs 9lbs which makes it relatively easy to carry anywhere. Can handle weights up to 240lbs. Close to the ground; making it difficult to get out of. This might not be the best offering from Tommy Bahama but it is versatile, strong and exceptionally easy to carry with you. The price is also affordable making it an excellent option for when you are on a budget. It is also worth noting that this chair is sold individually which might make it more attractive if you only need one chair! This is a pale blue chair with white flowers imprinted onto it, there is a distinctively taste of Hawaii which will immediately put you into beach mode. It is a stylish, comfortable and extremely practical option and is a top contender for the best chair on this list! This is a wide boy chair, the dimensions are 31.5 inches by 27.5 inches and it weighs just 11lbs. There is approximately 13 inches between the ground and the base of the seat making this beach chair easy to get out of. Lightweight – made from aluminum. Large carry pouch on rear. Padded backpack style straps for easy carrying. This is another example of why Tommy Bahama beach chairs are some of the best on the market. Designed with the taller and heavier person in mind it is a supportive and attractive option, with the added bonus of being good looking and you can choose your preferred color option. You can choose from a stylish light turquoise blue or a darker blue with an array of exotic flowers to help get you in the beach frame of mind. This chair has a couple of unique features and is designed to accommodate virtually any size of person. 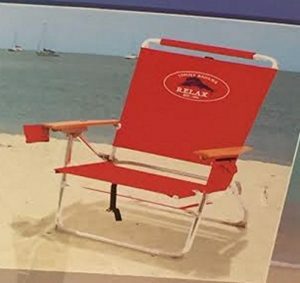 This is shown in the impressive measurements that this beach chair has to offer; it measures 25 inches by 29 inches; the largest of the Tommy Bahama beach chairs and yet it still weighs just 12.3 pounds. 5 Reclining positions including lie flat. Canopy included for protection from the sun. Aluminum equates to rust proof. Holds weights of up to 300lbs. Cup holder – which swings out. Towel bar which folds down. Only 8 inches between ground and seat. Large and bulky to carry on your shoulder for any distance, despite the light weight. This is an innovative offering from Tommy Bahama, particularly with the canopy. However, it is lacking in a few key areas, specifically pockets and the clearance from the ground for such a big chair. Although it is a good beach chair, there are better offerings on this list. This chair is a relatively recent offering to the market and there are no customer reviews yet on Amazon. However, if you are after something that gives you the same level of leg room as the chairs in your dining room then this is it. Whether you are very tall or have bad knees this is the ultimate chair for your comfort on the beach or elsewhere. It weighs just 9.4 pounds, is 28 inches by 21 inches and the seat base is 17 inches from the ground. 7 Different seating positions to ensure your comfort. Reduced stress on knees, neck and back; helping you to enjoy your time at the beach. Handles weights up to 300lbs. Aluminum frame – lightweight and rust proof. This chair will almost certainly make you feel like a director on the beach and it will ensure you are comfortable. In fact, the only reason it is not the top rated chair is that there are not enough customer reviews yet to give it this status. If you are looking for something a little simpler then the final option on this list could be exactly what you are looking for. This stylish offering is available in solid navy, green stripe, blue stripe or even a green print or blue print! This is a budget offering although it still measures 34 inches by 25 inches and weighs just 10lbs. 12 inches from ground to seat makes it easy to get in and out of. Can handle weights up to 250lbs. No pockets or cup holders. Not possible to lie flat. Folds flat but bulky to carry. You may find it bulky as it folds flat but is still large to carry with you. 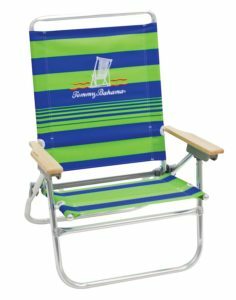 This is an excellent option if sitting on the beach is only one of the activities you need a beach chair for. It is perfect for watching the kids soccer match or sitting under the stars as well as on the beach with your feet in the water. The main issue is the lack of pockets or cup holder as this is a valuable, almost essential benefit. If you are looking to buy a Tommy Bahama Chair with wooden arms, unfortunately at the time of writing this article, the only model we could find was the model “Floral Relax” and “Navy Deluxe”. At this moment neither of them are available on Amazon. However they are available in the official Tommy Bahama store. The first thing to consider is how much you can afford to pay for your new Tommy Bahama beach chairs and the number of chairs you require. Many of the offerings in this list are for two chairs but it is possible to purchase them individually as this will help your funds to go further. It is never advisable to overspend as although a beach chair is a nice purchase it is not an essential one. You can purchase a good chair from approximately $50 or spend closer to $400; the choice is yours. Whether you’re looking for a cheap option or the best on the market this review guide will give you what you need; within your budget. The majority of the Tommy Bahama chairs on this list will allow you to sit in a variety of positions. However, not all chairs will. In addition some of these will lie flat which can be extremely beneficial if you wish to soak up the sun or even take a quick nap in the garden. (Speaking of garden, check out this review guide of the best Zero Gravity Chairs!) Of course, you’ll need to make sure you keep the sun cream topped up! It may seem tempting to save money and purchase a non-reclining version. However, the ability to adjust the position of the chairs will help to ensure you are comfortable. It is an important consideration. A pocket will allow you to keep your essential items, such as car keys or even make-up safe from the sand and wandering eyes. This will allow you to enjoy the water as well as the warmth in your chair. In addition you’ll find the addition of a cup holder to be virtually essential. Putting it on the sand may result in sand in your drink and over you as well as increasing the likelihood of knocking your drink over. As an added bonus you note that some of the more expensive chairs in this range actually have insulated pockets. This can help you to keep your drinks cool or even allow you to bring food to the beach with you without it melting; you can have your chocolate and eat it! If you are very light and slim you might not wish to get a wide chair, although you may find that you can actually curl up in it! The opposite is true if you are tall or heavily set; you will appreciate that while most beach chairs accommodate 250lbs the majority of the Tommy Bahama beach chairs will accommodate 300lbs. Even if you are smaller you may wish to choose the larger chair so that your friends can use it when necessary. Although these chairs are larger and a little more bulky to carry they generally do not weigh anymore than the standard size chairs. This means they are just as easy to carry to the beach or the soccer game as a smaller version. When considering the weight your beach chair is designed to support you must consider what the chair is made from. Aluminum and 600 denier fabric are an excellent starting point for strength and keeping the chair lightweight. There are two elements to height. The first is the height of the seat from the ground. Most beach chairs are approximately 8 inches which can be very comfortable but very awkward to get in and out of; they are low! However, Tommy Bahama chairs range from 8 inches to 17 inches; allowing you to choose the right chair for your size and the ease in which you can get up and down. The second height issue to consider is the size of the back rest. Ideally your beach chair will be as high as your head as this will allow you to relax properly without injuring your head or neck. If your head sits on the top bar of your chair or over it you’ll find there is not enough support and you will never be comfortable. The best way to test this is to sit in some chairs in your local store, before ordering them online. 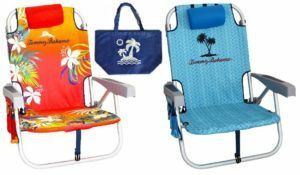 There are hundreds of different manufacturers which will sell you a beach chair. However, when you are spending your hard earned funds on a beach chair you need to consider the reputation of the manufacturer and the supplier. This can usually be easily seen by checking the customer feedback on Amazon. As you can see the Tommy Bahama beach chairs included in this review all feature well. While there will always be a few technical issues when mass producing items, the general feedback for all the products on this guide is generally favorable. This will give you peace of mind and ensure you purchase a product that is built to last. Looking for a new fishing chair? Check out the best fishing chair reviews! There is no better place to start looking for the best Tommy Bahama beach chairs, as indicated on this review guide, than Amazon. Of course, you can also purchase them from EBay or even your local store. 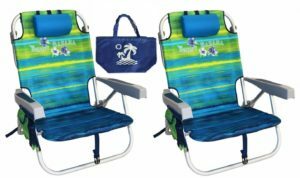 But, Amazon will provide you with a full range of feedback and some of the best prices for beach chairs; this makes it the best option when locating your new beach chair. It is important to consider what you need the chair for and how often you think you will use it. This will help you to select the right budget and the best Tommy Bahama beach chair for your needs. The best option on this review guide, if money is no option is the Backpack Cooler Chairs. They offer all the features you could need and are extremely comfortable. If budget is more of an issue then the Easy in / Easy Out is a good option. However for just a little more the beach chairs with tote bag, occupying the first spot on this review guide, are extremely difficult to beat for value. The position doesn’t adjust but all the extras you need are included. Ultimately the decision as to which Tommy Bahama beach chair or chairs you should purchase is yours. This review guide should help you to make the right decision and find the beach chair which will keep you happy and comfortable for years to come. If you’ve found this review guide helpful then let me know and share it with you friends. Your feedback is welcome and the opportunity to help your friends find the right chair can only be beneficial for you! Also, make sure to check out our latest post on some of the most amazing beach hacks!